Thank you for joining Arne Wellness Center for part two of this short blog series. Sciatic pain is one of the most common types of lower back pain that can affect just about anyone. This pain is considered a type of nerve pain that is caused when the sciatic nerve (the largest nerve in the human body) is aggravated by injury, stress, inflammation, spinal conditions, and other triggers. 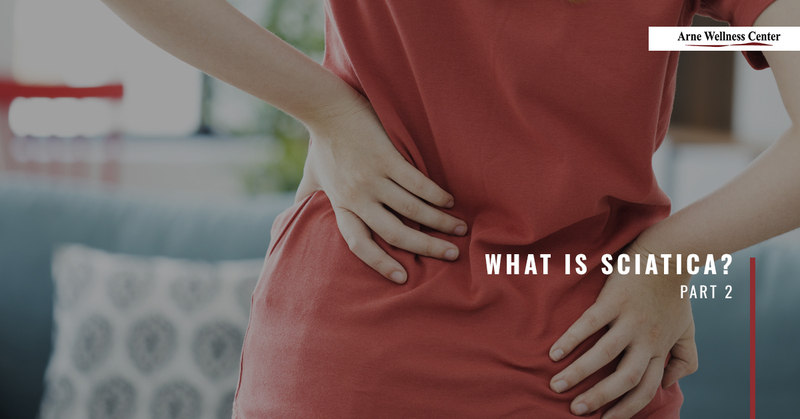 If you missed our recent post, we began exploring sciatica by looking at what this neuromuscular condition is, as well as three of the most common risk factors associated with this pain complaint. Here is a brief recap to get you up to speed, but we recommend reading part one to help you gain a better understanding of this complicated pain condition. Sciatic pain typically starts in the lumbar and sacral spine, affecting one or both sides of the body. Sciatica occurs when the nerve is aggravated in some way, which causes radiating pain to travel down the nerve pathway from the lower back, down through the buttocks, and into the upper legs (and sometimes into the lower legs and feet). Sciatic pain ranges from mild to severe and can inhibit movements and mobility. Common risk factors include trauma, occupation, and aging. Let’s explore sciatica further by looking at a few more risk factors, sciatic symptoms, and ways to find relief from sciatic pain. Carrying excess weight, especially in the midsection, places additional stress on the spinal column and supportive tissues in the lower back. As a result, obesity and rapid weight gain can add pressure on the lumbar and sacral plexuses, which can aggravate the sciatic nerve. A sedentary lifestyle is one of the top contributors to sciatic pain. Laying down for a long period of time and prolonged sitting cause pressure to build in the spine and supportive tissues. As a result, neuromuscular disorders can develop that affect the spinal discs (disc bulges) that can press against the sciatic nerve. Additionally, inactivity is terrible for circulation, which can limit the amount of oxygen and nutrients needed to support healthy cell and nerve function. Pain in the lower back that radiates down the hips into the glutes and legs. Discomfort ranging from a dull ache to a sharp pain while sitting or standing. Numbness and tingling along the nerve pathway. Limited range of motion and decreased movement. Natural treatments like chiropractic, acupuncture, and massage, along spinal traction (spinal decompression) offer effective pain relief for sciatica. Chiropractic adjustments realign the spinal vertebrae, making this therapy particularly effective for relieving pressure and tension from the sciatic nerve. Additionally, moving more throughout the day, standing for at least 20 minutes each hour, walking, and exercising can help stretch and strengthen the tissues in the lower back, helping to improve posture and prevent misalignments in the spine. If you or someone you love suffers from acute or chronic sciatic nerve pain, chiropractic adjustments release stress and tension from the lumbar spine, offering natural pain relief that lasts. Contact Arne Wellness Center to schedule an appointment with your Littleton chiropractor to find safe, natural, lasting relief from sciatic pain and other symptoms.